attractive ‘Soft Inclusive’ formula and a varied activities’ programme for adults and kids. Set in the international village of Rosa Marina, the resort is just a few paces from the sea, located amidst ancient palm and olive trees which mark the splendid Mediterranean garden. The resort’s position, just 9 km from Ostuni, means that visitors are easily able to access the main attractions of the Salento area and Valle d’Itria. The Nicolaus Club Ostuni Rosa Marina Resort is a welcoming family resort marked by its modern and pleasing Mediterranean style. The structure is set against a splendid natural backdrop hosting pools, sports facilities, an amphitheatre and the mini club. 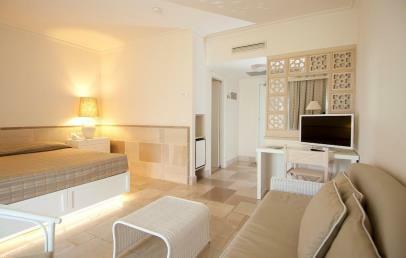 The 240 rooms of the resort are all large and well-lit, marked by their fresh style and soft colours. 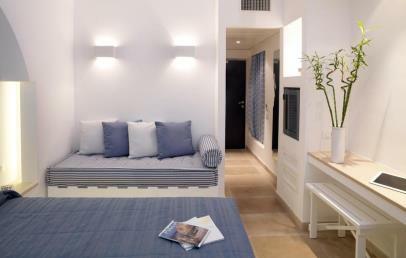 Each room has a cosy Mediterranean ambience and looks out over the garden with a veranda or small furnished terrace. All rooms have AC, hair dryer, phone, TV, mini bar and small safe. Communicating or adjoining rooms are available. The resort is about 500 m from a fine sandy beach, accessible either by a small tourist train or by walking along a track set in lush greenery. The lido “Il Pontile” offers guests beach umbrellas and sun beds, a restaurant, bar, pizzeria and other services. The rocky area next to the beach has wooden platforms with beach umbrellas and sun loungers. Cost of your stay includes one umbrella and two sun loungers per room (starting from the fifth row). Beach towels can be rented. The Prestige Formula, on request and subject to availability, is to be requested at the time of booking and paid on spot. 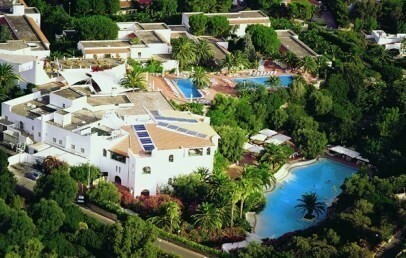 It includes: a beach umbrella and two sunbeds on the beach within the first four rows; first supply of drinks contained in the room minibar upon arrival; use of two beach towels per room; use of the bike without time limits; reserved car park in the area next to to the reception; 20% discount on spa treatments; late check-out with room release by noon. The trained staff of the Nicolino Club will be happy to entertain small guests with a lively programme of entertainment and sports activities, divided by age bracket: the Nicolino Baby Club (3-5,99 years), the Nicolino Mini Club (6-11,99 years), offers sports, teaching and recreational activities; the Nick Club (12-14,99 and 15-18 years) offers sports competitions and courses, shows and theme evenings. Breakfast, lunch and dinner are all served on a buffet with water and house wine on tap. Tables are assigned for the whole stay in company with other guests. Each week there is a typical dinner and a Gala Dinner (from the end of May to mid-September). From mid-June to early September (Sundays excluded), it will be possible to lunch directly on the beach at the bar pizzeria "Il Pontile", with buffet service with salads, pizza slices, the day’s first course and seasonal fruit, with water and house wine (table booking required). The Patio Bar welcomes guests for an aperitif at sunset. In the low season, the buffet service could be replaced by table service with a 3-course menu, at Management’s discretion. Food allergies: guests with gluten/lactose intolerance will find basic packaged products (bread, pasta, biscuits, ice cream) to which they can add their own personal products. Please indicate needs when booking. Soft Inclusive: this option includes full board with water and wine on tap during meals. At the Bar Centrale from 10:00 to 23:00 non-alcoholic drinks on tap, jugs of fruit juice, iced tea and granite. All served in plastic beakers. Please note – the Soft Inclusive does not include table service, coffee, alcoholic drinks, liqueurs, bottled and canned drinks and goods served at Il Pontile bar and restaurant. The resort has two pools, a lake-style pool, two lighted tennis courts, two five-a-side soccer pitches with synthetic grass (one reserved for kids) a multi-use court, beach volley and table tennis. In the high season, there is a rich programme of entertainment and sports with games, tourneys, group tennis lessons, fitness and dancing, evening entertainment with piano bar, shows at the amphitheatre and theme evenings. The sports activities, the amphitheatre and the Mini Club are not located in the main building but in a separate building, which can be reached on foot. The hall has free Wi-Fi connection and an internet point attracting payment. The following services attract payment: parking, evening use of sports facilities, buggy rental, beauty centre and massages, individual swimming and tennis lessons, bicycle rental, babysitting service and the services of an external doctor. The Comfort rooms, recently refurbished and furnished in perfect Mediterranean style, have a double bed and are located on the first floor or on the ground floor (most of them are on the ground floor). Each room looks out over the garden with a furnished veranda or small balcony. Rooms with connecting door or adjoining rooms are also available upon request. 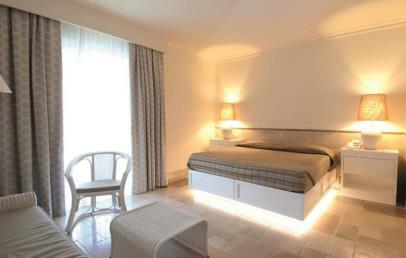 The Superior rooms, available only on the first floor, are large and have been completely refurbished. They have a double bed and a double sofa bed. Each room looks out over the garden and has a furnished veranda or small terrace. Stylishly furnished in ‘sea’ style, the Suites are set on different floors and consist of a double room and living area with double sofa bed. Each room looks out over the garden and has a veranda or a small furnished terrace. Rooms with connecting door or adjoining rooms are available. 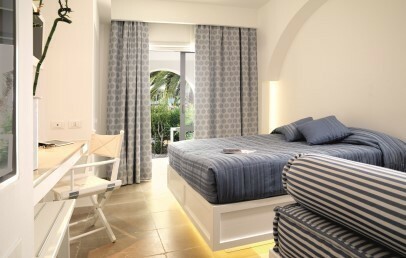 The Comfort rooms, recently refurbished and furnished in perfect Mediterranean style, have a double bed and are located on the first floor or on the ground floor (most of them are on the ground floor). Each room looks out over the garden with a furnished veranda or small balcony. The Easy rooms have a double bed, some with the possibility to add a 3rd bed. Each room looks out over the garden with a furnished veranda or small terrace. Early Booking - Book within April 30th 2019 and get a 15% reduction on your stay! Reduced price valid until April 30th 2019!